We are now into Round 3 of the Euroleague regular season and the hosts are still winless. This means that there will be a lot of pressure on them to get off the mark but if they do, they’ll tie their opponents with a 1-2 record after the three games. Its early in the season but the temperature is rising for a few times. This is the first time these two sides have clashed in the Euroleague and the hosts really need to win. They may be 0-2 but they can point to areas in their recent outings where they have performed well. In fact, Unics have held double-digit leads in the second half of both of the games they’ve played this campaign. This suggests that the Russians are doing some things right but equally, they must be getting something wrong. Keith Langford is averaging 19 points per game so far, fourth in the overall league, and Coty Clarke has picked up an average of 14 points per game. Sadly, Clarke will be absent with injury for around 6 weeks. The Turkish side comes into this game with a 1-1 record and they’ll be looking for Adrien Moerman to deliver the goods. He has an average of 15 points per game but he isn’t the only player making an impact on the games. This is because Brad Wanamaker and Will Clyburn both have an average of 13.5 points per game this season. If these players reach that level again, the away team will fancy their chances. So far, Darussafaka have been defending better than Unics and that could be the deciding factor in this game but both sides will think they can win here. This has the hallmarks of being a tight game and the bookmakers aren’t placing too much between these sides. 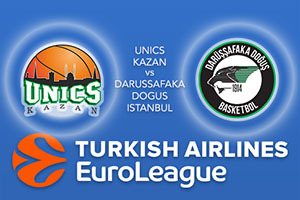 You should look to take Darussafaka Dogus Istanbul at +1.5, which you can find on offer at odds of 1.90. If you’re looking at the Over/Under market for basketball betting with the Euroleague, go OVER 153.5 which you can find on offer at odds of 1.90. Bet Now!